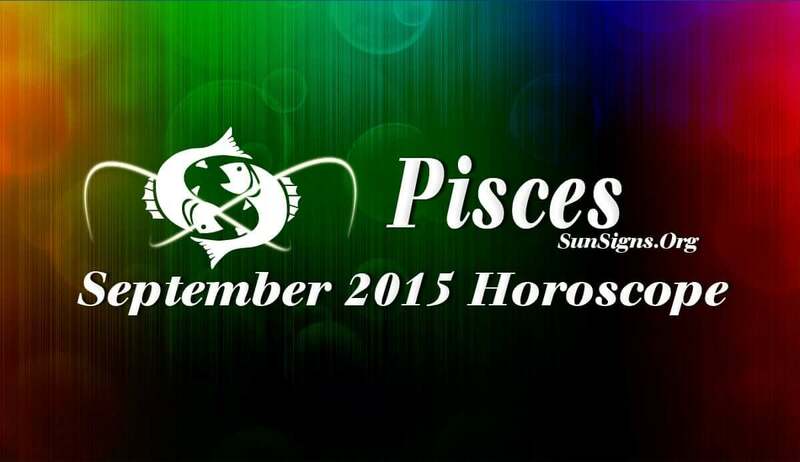 Pisces September 2015 Horoscope predicts that your self-reliance and rigidity have no value and you need to compromise. Collaboration with other people will help you succeed in life. But this might be a little difficult as Mercury the planet of communication is in retrograde in September 2015. (Read about Mercury retrograde). Career will be a dominant factor for people born under the sign of the Fish. Your success depends on how well you can balance your career and family life. This is not a time to neither reflect on your inner self nor indulge in personal desires. In September 2015, relations with colleagues at the work place or with business partners will be harmonious. The Pisceans will not face many challenges in their professional life. Monetary situation will be delicate for the Pisces zodiac sign in this period and situation will be better after 23rd September 2015. You should avoid taking major financial decisions. Large scale investments and money purchases should be studied critically and can be done at a later date. September 2015 is a splendid month for love and dating. Love keeps you going against all odds. Romantic relationships will happen automatically and you should strive hard to sustain the partnership. Take this zodiac compatibility test to know where you stand in your relationship. The Pisces astrology predictions for September 2015 forecast that marriages will prosper and so will your chances for pregnancy. Relations with family and friends will be blissful. The September 2015 Pisces horoscope foretells that your health will be fragile and requires constant care. Last week of the month will be better for your emotional health. Only remedy is to take sufficient rest and sleep well for at least eight hours every day. Indigestion and heart burn might trouble you this month.